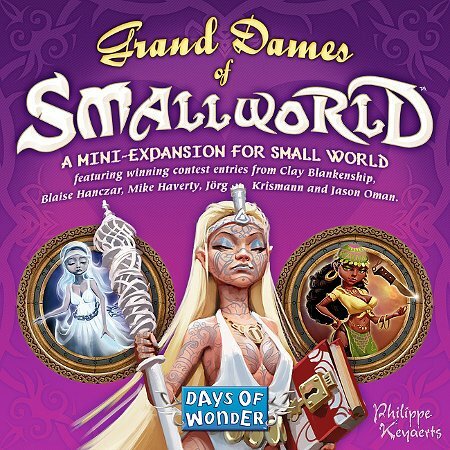 The Grand Dames of Small World will feature Priestesses, White Ladies, and Gypsies, along with Historian and Peace-loving Special Powers. Other products in the "Small World" series. Adds gypsies as a race that with the right combination of power can almost unsure a victory. I would buy this expansion second to the Cursed expansion, due to the fact that the powers and races added in cursed I personally think add a bit more than the Dames do. Still a great expansion, despite the small amount of content it adds. This is a great but small expansion for Small World, introducing 3 new races and 2 new banners. Races and banners tend to influence declined races. A solid addition, bringing fresh life into the game! An interesting expansion with some powerful and fun new races/powers. Some of these were actually created by Small World fans which i feel makes it even more fun and silly! I really enjoy this expansion, the addition of the white tower. Another minor addition to an already amazing game.